This chapter describes how to use VNC services, including NVA and VNC-GW functions. Background information on NVAs, NVE s, UN s, and VN is available from the IETF. VNC-GW s support the import/export of routing information between VNC and CE routers operating within a VN. Both IP/Layer 3 (L3) VNs, and IP with Ethernet/Layer 2 (L2) VNs are supported. BGP, with IP VPNs and Tunnel Encapsulation, is used to distribute VN information between NVAs. BGP based IP VPN support is defined in RFC 4364, and RFC 4659. Encapsulation information is provided via the Tunnel Encapsulation Attribute, RFC 5512. The protocol that is used to communicate routing and Ethernet / Layer 2 (L2) forwarding information between NVAs and NVEs is referred to as the Remote Forwarder Protocol (RFP). OpenFlow is an example RFP. Specific RFP implementations may choose to implement either a hard-state or soft-state prefix and address registration model. To support a soft-state refresh model, a lifetime in seconds is associated with all registrations and responses. The chapter also provides sample configurations for basic example scenarios. General VNC configuration applies to general VNC operation and is primarily used to control the method used to advertise tunnel information. Remote Forwarder Protocol (RFP) configuration relates to the protocol used between NVAs and NVEs. VNC Defaults provides default parameters for registered NVEs. VNC NVE Group provides for configuration of a specific set of registered NVEs and overrides default parameters. Redistribution and Export control VNC-GW operation, i.e., the import/export of routing information between VNC and customer edge routers (CE s) operating within a VN. This is a simple example configuration parameter included as part of the RFP example code. VALUE must be in the range of 0 to 4294967295. The VNC Defaults section allows the user to specify default values for configuration parameters for all registered NVEs. Default values are overridden by VNC NVE Group Configuration. Enter VNC configuration mode for specifying VNC default behaviors. Use exit-vnc to leave VNC configuration mode. vnc defaults is optional. These are the statements that can appear between vnc defaults and exit-vnc. Documentation for these statements is given in VNC NVE Group Configuration. A NVE Group corresponds to a specific set of NVEs. A Client NVE is assigned to an NVE Group based on whether there is a match for either its virtual or underlay network address against the VN and/or UN address prefixes specified in the NVE Group definition. When an NVE Group definition specifies both VN and UN address prefixes, then an NVE must match both prefixes in order to be assigned to the NVE Group. In the event that multiple NVE Groups match based on VN and/or UN addresses, the NVE is assigned to the first NVE Group listed in the configuration. If an NVE is not assigned to an NVE Group, its messages will be ignored. Configuration values specified for an NVE group apply to all member NVEs and override configuration values specified in the VNC Defaults section. At least one `nve-group` is mandatory for useful VNC operation. Enter VNC configuration mode for defining the NVE group name . Use exit or exit-vnc to exit group configuration mode. Delete the NVE group named name . Set the value used to distinguish NVEs connected to the same physical Ethernet segment (i.e., at the same location) . The nve-id subfield may be specified as either a literal value in the range 1-255, or it may be specified as auto:vn , which means to use the least-significant octet of the originating NVE’s VN address. Specify the matching prefix for this NVE group by either virtual-network address ( vn ) or underlay-network address ( un ). Either or both virtual-network and underlay-network prefixes may be specified. Subsequent virtual-network or underlay-network values within a vnc nve-group exit-vnc block override their respective previous values. These prefixes are used only for determining assignments of NVEs to NVE Groups. 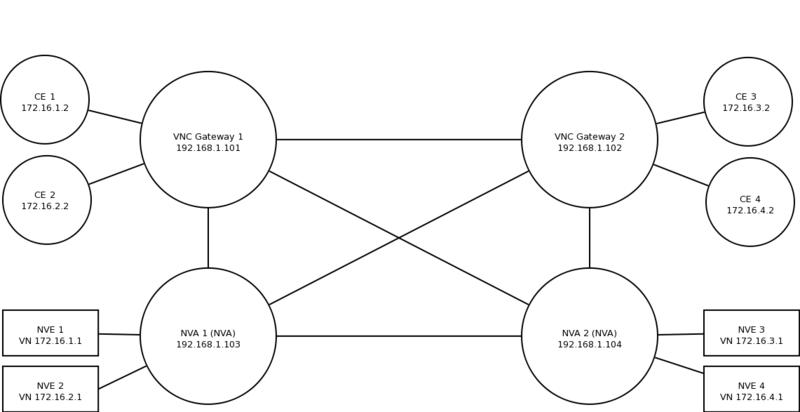 Routes originated by NVEs in the NVE group will use the group’s specified route-distinguisher when they are advertised via BGP. If the auto form is specified, it means that a matching NVE has its RD set to rd_type=IP=1:IPv4-address=VN-address:two-byte-integer, for IPv4 VN addresses and rd_type=IP=1:IPv4-address=Last-four-bytes-of-VN-address:two-byte-integer, for IPv6 VN addresses. If the NVE group definition does not specify a route-distinguisher , then the default route-distinguisher is used. If neither a group nor a default route-distinguisher is configured, then the advertised RD is set to two-byte-autonomous-system-number=0:four-byte-integer=0. Specify the response lifetime, in seconds, to be included in RFP response messages sent to NVEs. If the value ‘infinite’ is given, an infinite lifetime will be used. Note that this parameter is not the same as the lifetime supplied by NVEs in RFP registration messages. This parameter does not affect the lifetime value attached to routes sent by this server via BGP. If the NVE group definition does not specify a response-lifetime , the default response-lifetime will be used. If neither a group nor a default response-lifetime is configured, the value 3600 will be used. The maximum response lifetime is 2147483647. The first form, rt export , specifies an export rt-list . The export rt-list will be attached to routes originated by NVEs in the NVE group when they are advertised via BGP. If the NVE group definition does not specify an export rt-list , then the default export rt-list is used. If neither a group nor a default export rt-list is configured, then no RT list will be sent; in turn, these routes will probably not be processed by receiving NVAs. The second form, rt import specifies an import rt-list , which is a filter for incoming routes. In order to be made available to NVEs in the group, incoming BGP VPN routes must have RT lists that have at least one route target in common with the group’s import rt-list . If the NVE group definition does not specify an import filter, then the default import rt-list is used. If neither a group nor a default import rt-list is configured, there can be no RT intersections when receiving BGP routes and therefore no incoming BGP routes will be processed for the group. The third, rt both , is a shorthand way of specifying both lists simultaneously, and is equivalent to rt export `rt-list` followed by rt import `rt-list` . Specify that the named route-map should be applied to routes being exported to bgp or zebra. This parameter is used in conjunction with Configuring Export of Routes to Other Routing Protocols. This item is optional. Specify that no route-map should be applied to routes being exported to bgp or zebra. This parameter is used in conjunction with Configuring Export of Routes to Other Routing Protocols. This item is optional. Specify that the named prefix-list filter should be applied to routes being exported to bgp or zebra. Prefix-lists for ipv4 and ipv6 are independent of each other. This parameter is used in conjunction with Configuring Export of Routes to Other Routing Protocols. This item is optional. Specify that no prefix-list filter should be applied to routes being exported to bgp or zebra. This parameter is used in conjunction with Configuring Export of Routes to Other Routing Protocols. This item is optional. The route targets advertised with prefixes and addresses registered by an NVE are determined based on the NVE’s associated VNC NVE Group Configuration, VNC NVE Group Configuration. Layer 2 (L2) Groups are used to override the route targets for an NVE’s Ethernet registrations based on the Logical Network Identifier and label value. A Logical Network Identifier is used to uniquely identify a logical Ethernet segment and is conceptually similar to the Ethernet Segment Identifier defined in RFC 7432. Both the Logical Network Identifier and Label are passed to VNC via RFP prefix and address registration. Note that a corresponding NVE group configuration must be present, and that other NVE associated configuration information, notably RD, is not impacted by L2 Group Configuration. Enter VNC configuration mode for defining the L2 group name . Use exit or exit-vnc to exit group configuration mode. Delete the L2 group named name . Define the Logical Network Identifier with a value in the range of 0-4294967295 that identifies the logical Ethernet segment. Add or remove labels associated with the group. label-list is a space separated list of label values in the range of 0-1048575. Specify the route target import and export value associated with the group. A complete definition of these parameters is given above, VNC NVE Group Configuration. Routes from other protocols (including BGP) can be provided to VNC (both for RFP and for redistribution via BGP) from three sources: the zebra kernel routing process; directly from the main (default) unicast BGP RIB; or directly from a designated BGP unicast exterior routing RIB instance. The protocol named in the vnc redistribute command indicates the route source: bgp-direct routes come directly from the main (default) unicast BGP RIB and are available for RFP and are redistributed via BGP; bgp-direct-to-nve-groups routes come directly from a designated BGP unicast routing RIB and are made available only to RFP; and routes from other protocols come from the zebra kernel routing process. Note that the zebra process does not need to be active if only bgp-direct or bgp-direct-to-nve-groups routes are used. Routes originating from protocols other than BGP must be obtained via the zebra routing process. Redistribution of these routes into VNC does not support policy mechanisms such as prefix-lists or route-maps. bgp-direct redistribution supports policy via prefix lists and route-maps. This policy is applied to incoming original unicast routes before the redistribution translations (described below) are performed. Redistribution of bgp-direct routes is performed in one of three possible modes: plain , nve-group , or resolve-nve . The default mode is plain . These modes indicate the kind of translations applied to routes before they are added to the VNC RIB. The VN address is set to the original unicast route’s next hop address. The RT list is included in the extended community list copied from the original unicast route (i.e., it must be set in the original unicast route). The next hop/VN address is set to the VN prefix configured for the redistribute nve-group. The UN address is set to the UN prefix configured for the redistribute nve-group. The RD is set to the RD configured for the redistribute nve-group. The RT list is set to the RT list configured for the redistribute nve-group. If bgp-direct routes are being redistributed, any extended communities present in the original unicast route will also be included. 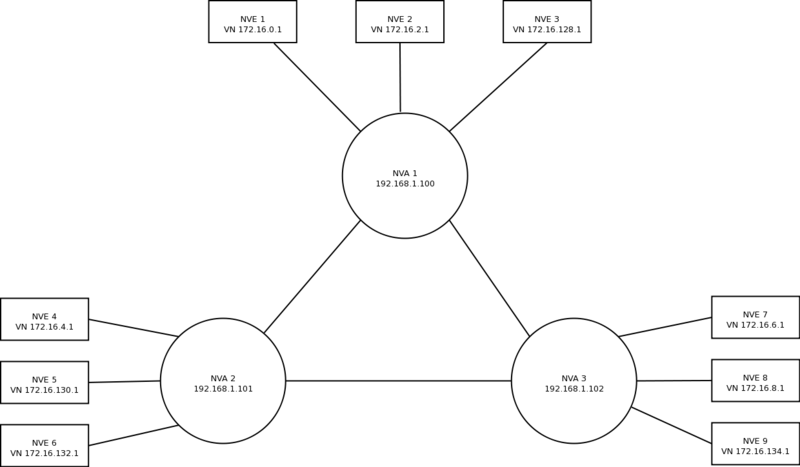 In resolve-nve mode, the next hop of the original BGP route is typically the address of an NVE connected router (CE) connected by one or more NVEs. Each of the connected NVEs will register, via RFP, a VNC host route to the CE. This mode may be though of as a mechanism to proxy RFP registrations of BGP unicast routes on behalf of registering NVEs. Multiple copies of the BGP route, one per matching NVE host route, will be added to VNC. In other words, for a given BGP unicast route, each instance of a RFP-registered host route to the unicast route’s next hop will result in an instance of an imported VNC route. Each such imported VNC route will have a prefix equal to the original BGP unicast route’s prefix, and a next hop equal to the next hop of the matching RFP-registered host route. If there is no RFP-registered host route to the next hop of the BGP unicast route, no corresponding VNC route will be imported. The Next Hop is set to the next hop of the NVE route (i.e., the VN address of the NVE). An added route-origin extended community with the next hop of the original BGP route is added to the new route. The value of the local administrator field defaults 5226 but may be configured by the user via the roo-ec-local-admin parameter. The Tunnel Encapsulation attribute is set to the value of the Tunnel Encapsulation attribute of the NVE route, if any. Unicast routes from the main or a designated instance of BGP may be redistributed to VNC as bgp-direct-to-nve-groups routes. These routes are NOT announced via BGP, but they are made available for local RFP lookup in response to queries from NVEs. A non-main/default BGP instance is configured using the bgp multiple-instance and router bgp AS view NAME commands as described elsewhere in this document. In order for a route in the unicast BGP RIB to be made available to a querying NVE, there must already be, available to that NVE, an (interior) VNC route matching the next hop address of the unicast route. When the unicast route is provided to the NVE, its next hop is replaced by the next hop of the corresponding NVE. If there are multiple longest-prefix-match VNC routes, the unicast route will be replicated for each. There is currently no policy (prefix-list or route-map) support for bgp-direct-to-nve-groups routes. Import (or do not import) prefixes from another routing protocols. Specify both the address family to import ( ipv4 or ipv6 ) and the protocol ( bgp , bgp-direct , bgp-direct-to-nve-groups , connected , kernel , ospf , rip , or static ). Repeat this statement as needed for each combination of address family and routing protocol. Prefixes from protocol bgp-direct are imported from unicast BGP in the same bgpd process. Prefixes from all other protocols (including bgp ) are imported via the zebra kernel routing process. Redistribute routes from other protocols into VNC using the specified mode. Not all combinations of modes and protocols are supported. When using nve-group mode, assign (or do not assign) the NVE group group-name to routes redistributed from another routing protocol. group-name must be configured using vnc nve-group . The VN and UN prefixes of the nve-group must both be configured, and each prefix must be specified as a full-length (/32 for IPv4, /128 for IPv6) prefix. Assign a registration lifetime, either lifetime seconds or infinite , to prefixes redistributed from other routing protocols as if they had been received via RFP registration messages from an NVE. lifetime can be any integer between 1 and 4294967295, inclusive. Assign a value to the local-administrator subfield used in the Route Origin extended community that is assigned to routes exported under the resolve-nve mode. The default value is 5226 . The following four prefix-list and route-map commands may be specified in the context of an nve-group or not. If they are specified in the context of an nve-group, they apply only if the redistribution mode is nve-group , and then only for routes being redistributed from bgp-direct . If they are specified outside the context of an nve-group, then they apply only for redistribution modes plain and resolve-nve , and then only for routes being redistributed from bgp-direct . When redistributing bgp-direct routes, specifies that the named prefix-list should be applied. When redistributing bgp-direct routes, specifies that no prefix-list should be applied. When redistributing bgp-direct routes, specifies that the named route-map should be applied. When redistributing bgp-direct routes, specifies that no route-map should be applied. Routes from VNC (both for RFP and for redistribution via BGP) can be provided to other protocols, either via zebra or directly to BGP. It is important to note that when exporting routes to other protocols, the downstream protocol must also be configured to import the routes. For example, when VNC routes are exported to unicast BGP, the BGP configuration must include a corresponding redistribute vnc-direct statement. Specify how routes should be exported to bgp or zebra. If the mode is none , routes are not exported. If the mode is group-nve , routes are exported according to nve-group or vrf-policy group configuration (VNC NVE Group Configuration): if a group is configured to allow export, then each prefix visible to the group is exported with next hops set to the currently-registered NVEs. If the mode is registering-nve , then all VNC routes are exported with their original next hops. If the mode is ce , only VNC routes that have an NVE connected CE Router encoded in a Route Origin Extended Community are exported. This extended community must have an administrative value that matches the configured roo-ec-local-admin value. The next hop of the exported route is set to the encoded NVE connected CE Router. The default for both bgp and zebra is mode none . When export mode is group-nve , export (or do not export) prefixes from the specified nve-group or vrf-policy group to unicast BGP or to zebra. Repeat this statement as needed for each nve-group to be exported. Each VNC prefix that is exported will result in N exported routes to the prefix, each with a next hop corresponding to one of the N NVEs currently associated with the nve-group. Some commands have a special meaning under certain export modes. When export mode is ce or registering-nve , specifies that the named prefix-list should be applied to routes being exported to bgp or zebra. Prefix-lists for ipv4 and ipv6 are independent of each other. When export mode is ce or registering-nve , specifies that no prefix-list should be applied to routes being exported to bgp or zebra. When export mode is ce or registering-nve , specifies that the named route-map should be applied to routes being exported to bgp or zebra. When export mode is ce or registering-nve , specifies that no route-map should be applied to routes being exported to bgp or zebra. This command is valid inside a nve-group RFG-NAME block. It specifies that the named route-map should be applied to routes being exported to bgp or zebra. This command is valid inside a nve-group RFG-NAME block. It specifies that no route-map should be applied to routes being exported to bgp or zebra. This command is valid inside a nve-group RFG-NAME block. It specifies that the named prefix-list filter should be applied to routes being exported to bgp or zebra. Prefix-lists for ipv4 and ipv6 are independent of each other. This command is valid inside a nve-group RFG-NAME block. It specifies that no prefix-list filter should be applied to routes being exported to bgp or zebra. The commands in this section can be used to augment normal dynamic VNC. The add vnc commands can be used to manually add IP prefix or Ethernet MAC address forwarding information. The clear vnc commands can be used to remove manually and dynamically added information. Register an IP prefix on behalf of the NVE identified by the VN and UN addresses. The cost parameter provides the administrative preference of the forwarding information for remote advertisement. If omitted, it defaults to 255 (lowest preference). The lifetime parameter identifies the period, in seconds, that the information remains valid. If omitted, it defaults to infinite . The optional local-next-hop parameter is used to configure a nexthop to be used by an NVE to reach the prefix via a locally connected CE router. This information remains local to the NVA, i.e., not passed to other NVAs, and is only passed to registered NVEs. When specified, it is also possible to provide a local-cost parameter to provide a forwarding preference. If omitted, it defaults to 255 (lowest preference). Register a MAC address for a logical Ethernet (L2VPN) on behalf of the NVE identified by the VN and UN addresses. The optional prefix parameter is to support enable IP address mediation for the given prefix. The cost parameter provides the administrative preference of the forwarding information. If omitted, it defaults to 255. The lifetime parameter identifies the period, in seconds, that the information remains valid. If omitted, it defaults to infinite . Delete the information identified by prefix, VN address, and UN address. Any or all of these parameters may be wildcarded to (potentially) match more than one registration. The optional mac parameter specifies a layer-2 MAC address that must match the registration(s) to be deleted. The optional local-next-hop parameter is used to delete specific local nexthop information. Delete mac forwarding information. Any or all of these parameters may be wildcarded to (potentially) match more than one registration. The default value for the prefix parameter is the wildcard value * . Delete prefixes associated with the NVE specified by the given VN and UN addresses. It is permissible to specify only one of VN or UN, in which case any matching registration will be deleted. It is also permissible to specify * in lieu of any VN or UN address, in which case all registrations will match. Note: VNC-Related configuration can be obtained via the show running-configuration command when in enable mode. Reset the counter values stored by the NVA. Counter values can be seen using the show vnc commands listed above. This command is only available in enable mode. Print counter values and other general information about the NVA. Counter values can be reset using the clear vnc counters command listed below. Display the NVA’s current clients. Specifying address limits the output to the NVEs whose addresses match address . The time since the NVA last communicated with the NVE, per-NVE summary counters and each NVE’s addresses will be displayed. Display active Query information. Queries remain valid for the default Response Lifetime (VNC Defaults Configuration) or NVE-group Response Lifetime (VNC NVE Group Configuration). Specifying prefix limits the output to Query Targets that fall within prefix . Query information is provided for each querying NVE, and includes the Query Target and the time remaining before the information is removed. Display local, remote, holddown, and/or imported registration information. Local registrations are routes received via RFP, which are present in the NVA Registrations Cache. Remote registrations are routes received via BGP (VPN SAFIs), which are present in the NVE-group import tables. Holddown registrations are local and remote routes that have been withdrawn but whose holddown timeouts have not yet elapsed. Imported information represents routes that are imported into NVA and are made available to querying NVEs. Depending on configuration, imported routes may also be advertised via BGP. Specifying prefix limits the output to the registered prefixes that fall within prefix . Registration information includes the registered prefix, the registering NVE addresses, the registered administrative cost, the registration lifetime and the time since the information was registered or, in the case of Holddown registrations, the amount of time remaining before the information is removed. Display all, active and/or removed response information which are present in the NVA Responses Cache. Responses remain valid for the default Response Lifetime (VNC Defaults Configuration) or NVE-group Response Lifetime (VNC NVE Group Configuration.) When Removal Responses are enabled (General VNC Configuration), such responses are listed for the Response Lifetime. Specifying prefix limits the output to the addresses that fall within prefix . Response information is provided for each querying NVE, and includes the response prefix, the prefix-associated registering NVE addresses, the administrative cost, the provided response lifetime and the time remaining before the information is to be removed or will become inactive. Print the number of memory items allocated by the NVA. This example includes three NVAs, nine NVEs, and two NVE groups. Note that while not shown, a single physical device may support multiple logical NVEs. A three-way full mesh with three NVEs per NVA. shows code NVA-1 (192.168.1.100), NVA 2 (192.168.1.101), and NVA 3 (192.168.1.102), which are connected in a full mesh. Each is a member of the autonomous system 64512. Each NVA provides VNC services to three NVE clients in the 172.16.0.0/16 virtual-network address range. The 172.16.0.0/16 address range is partitioned into two NVE groups, group1 (172.16.0.0/17) and group2 (172.16.128.0/17). Each NVE belongs to either NVE group group1 or NVE group group2. The NVEs NVE 1, NVE 2, NVE 4, NVE 7, and NVE 8 are members of the NVE group group1. The NVEs NVE 3, NVE 5, NVE 6, and NVE 9 are members of the NVE group group2. Each NVA advertises NVE underlay-network IP addresses using the Tunnel Encapsulation Attribute. A three-way full mesh with three NVEs per NVA. This example includes two NVAs, each with two associated NVEs, and two VNC-GWs, each supporting two CE routers physically attached to the four NVEs. Note that this example is showing a more complex configuration where VNC-GW is separated from normal NVA functions; it is equally possible to simplify the configuration and combine NVA and VNC-GW functions in a single FRR instance. As shown in Meshed NVEs and VNC-GWs, NVAs and VNC-GWs are connected in a full iBGP mesh. The VNC-GWs each have two CEs configured as route-reflector clients. Each client provides BGP updates with unicast routes that the VNC-GW reflects to the other client. The VNC-GW also imports these unicast routes into VPN routes to be shared with the other VNC-GW and the two NVAs. This route importation is controlled with the vnc redistribute statements shown in the configuration. Similarly, registrations sent by NVEs via RFP to the NVAs are exported by the VNC-GWs to the route-reflector clients as unicast routes. RFP registrations exported this way have a next-hop address of the CE behind the connected (registering) NVE. Exporting VNC routes as IPv4 unicast is enabled with the vnc export command below. The configuration for VNC-GW 1 is shown below. Note that in the VNC-GW configuration, the neighboring VNC-GW and NVAs each have a statement disabling the IPv4 unicast address family. IPv4 unicast is on by default and this prevents the other VNC-GW and NVAs from learning unicast routes advertised by the route-reflector clients. A route reflector eliminates the need for a fully meshed NVA network by acting as the hub between NVAs. Two NVAs and a BGP Route Reflector shows BGP route reflector BGP Route Reflector 1 (192.168.1.100) as a route reflector for NVAs NVA 2``(192.168.1.101) and ``NVA 3 (192.168.1.102). NVA 2 and NVA 3 advertise NVE underlay-network IP addresses using the Tunnel Encapsulation Attribute. BGP Route Reflector 1 reflects'' advertisements from ``NVA 2 to NVA 3 and vice versa. As in the example of Mesh NVA Configuration, there are two NVE groups. The 172.16.0.0/16 address range is partitioned into two NVE groups, group1 (172.16.0.0/17) and group2 (172.16.128.0/17). The NVE NVE 4, NVE 7, and NVE 8 are members of the NVE group group1. The NVEs NVE 5, NVE 6, and NVE 9 are members of the NVE group group2. While not shown, an NVA can also be configured as a route reflector. This example is identical to VNC with FRR Route Reflector Configuration with the exception that the route reflector is a commercial router. Only the VNC-relevant configuration is provided. This example combines the previous two (VNC with FRR Route Reflector Configuration and VNC with Commercial Route Reflector Configuration) into a redundant route reflector configuration. 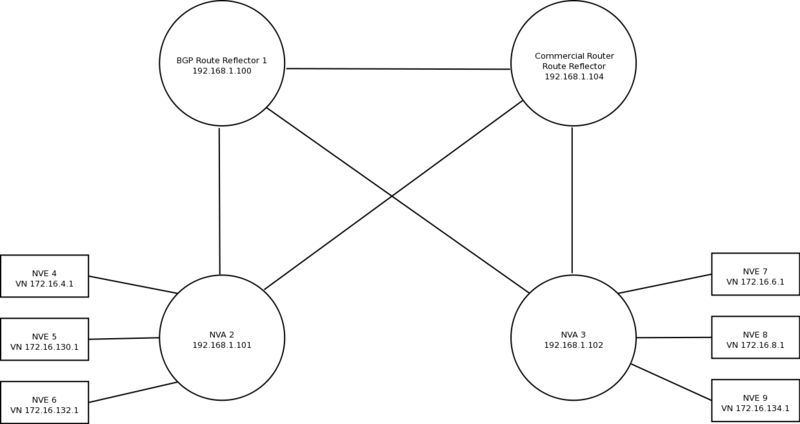 BGP route reflectors BGP Route Reflector 1 and Commercial Router are the route reflectors for NVAs NVA 2 and NVA 3. The two NVAs have connections to both route reflectors. The nve-id is carried in the route distinguisher. It is the second octet of the eight-octet route distinguisher generated for Ethernet / L2 advertisements. The first octet is a constant 0xFF, and the third through eighth octets are set to the L2 ethernet address being advertised.